You can also use the Sheepdog Seminar to raise money for your church, youth group, mission trips, etc. 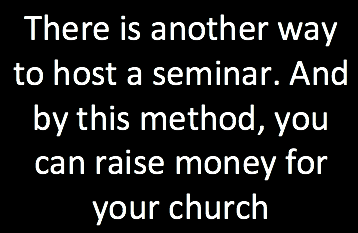 Any funds that come in for the seminar in excess of the agreed amount, are given to the church. For example, if the agreed cost to host is $5,000, and $10,000 comes in by way of registrations, then $5000 will remain with the church. Sheepdog Seminars will honor the agreement no matter how much excess money comes in. If the agreement is $5,000, and $45,000 comes in by way of registrations, vendor fees, etc - the church will profit $40,000. If you’re interested in this type of seminar, text “fundraise” to 817.437.9693 - we will get back with you asap.